The most distant known quasars show that some supermassive black holes formed when the universe was merely 6 percent of its current age, or about 700 million years after the big bang. How black holes of several billion solar masses formed so rapidly in the very early universe is one mystery raised by astronomers with the Sloan Digital Sky Survey (SDSS). 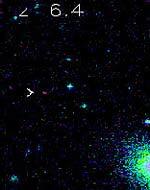 They have discovered 13 of the oldest, most distant quasars yet found. “We hope to at least double that number in the next three years,” said Xiaohui Fan of the University of Arizona?s Steward Observatory in Tucson. Fan led the SDSS team that discovered the distant quasars, which are compact but luminous objects thought to be powered by supermassive black holes. The most distant quasar, in the constellation Ursa Major, is roughly 13 billion light years away. The most ancient quasars raise other tantalizing questions about the early universe. Fan talked about it today (Feb. 13) at the American Association for the Advancement of Science annual meeting in Seattle. The infant universe was hydrogen and helium. Astronomers estimate the current age of the universe at 13.7 billion years. Quasars in the early universe looked as mature as nearby galaxies that, like the Milky Way, formed a couple of billion years after the big bang. Also, radio astronomers collaborating with SDSS researchers detected carbon monoxide, a key component of molecular clouds, near the ancient quasars. All this evidence suggests that the first mature galaxies formed right along with the ancient supermassive black holes in the very early universe. Although cosmologists aren?t panicked, they need to refine theory to clarify what?s going on. Fan and his colleagues believe the oldest quasars can be used to probe the end of the Cosmic Dark Ages and the beginning of the Cosmic Renaissance. In so-called Cosmic Dark Ages, the universe was a cold, opaque place without stars. Then came a critical phase where the universe went through a rapid transition. The first galaxies and quasars formed in the Cosmic Renaissance, heating the universe so it became the place we see today. Fan and his colleagues believe some of their oldest known quasars may span the critical transition. Current observations have just begun to reveal when and how this ionization process occurred. Data from distant quasars combined with other evidence, such as from the cosmic microwave background, which is relict radiation from the big bang, will begin to test theory of how the first galaxies appeared in the universe, Fan said. It may take the large-aperture space telescope, NASA’s 6.5-meter James Webb Space Telescope, to really explore what happened between the Cosmic Dark Ages and the Cosmic Renaissance, Fan said. Optical/infrared ground-based telescopes cannot detect objects red-shifted much beyond 6.5, Fan noted. Water vapor in Earth?s atmosphere absorbs longer infrared wavelengths, so it will take a space-based telescope, probably with an aperture larger than that of the NASA Spitzer Telescope now orbiting Earth, to study objects at redshift 7, 8, or 10 in detail, Fan said.